The Orphan Choir is the third novel I've read in Hammer's series of horror novels by by non-horror authors - the others being Helen Dunmore's The Greatcoat, which I loved, and Jeanette Winterson's The Daylight Gate, which I wanted to love but didn't. By crime writer and poet Sophie Hannah, The Orphan Choir is part ghost story, part psychological thriller, with a tense, oppressive atmosphere and an intriguingly unreliable narrator. The story opens with narrator Louise driven to distraction by a feckless, selfish neighbour who plagues her regularly with his loud music. (If Louise's reaction to this seems extreme, I speak as someone who once suffered a similar problem with my own neighbour and I assure that Louise's taut, paranoid fury is all too plausible.) Despite the support of Pat Jervis, the Environmental Health Officer who arrives to investigate the noise in the middle of the night, the noise continues - and this time, it seems that Louise's neighbour has found a new way to torment her. He's stopped playing his former repertoire of 80s hits, and instead, he's moved on to choral church music, sung by boy choristers. Desperately missing her seven-year-old son Joseph, who has recently begun boarding at a prestigious choir school and feeling horribly claustrophobic as work on the exterior of the house generates endless dust and blocks out natural light, Louise appears to descend into obsession and hysteria. A second home in an almost disturbingly peaceful gated community in the countryside could be the answer ... or will the voices of the choir follow her there too? One of the great successes of The Orphan Choir is the deftly constructed narrative. It's Louise herself who tells the story, and it's often hard for the reader to gauge the state of Louise's mental health - just at is for her occasionally dismissive but ultimately confused husband Stuart. Louise is sharply witty and observant but she's also prone to paranoia and erratic behaviour at times. Could the biggest danger faced by Louise, and even her son Joseph, actually be Louise herself? Is it possible that the voices she hears and the visions she sees are figments of an increasingly over-active imagination? In this sense, I heard echoes of The Turn of the Screw in The Orphan Choir, and that, of course, can only be an excellent thing. The Orphan Choir works well, then, as a psychological mystery - but what of the ghost story? Well, I'm glad to say that Sophie Hannah has made a fine job of her foray into supernatural horror, and Hannah has an excellent command of those essential elements of eerie, slowly escalating suspense characteristic of all the best ghost literature. 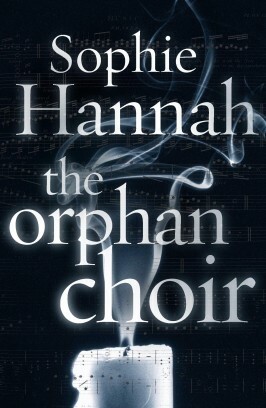 I found The Orphan Choir tense, chilling and unsettling, and it seems clear to me that Sophie Hannah has a genuine respect and understanding for the genre (something I found sadly lacking in Jeanette Winterson's The Daylight Gate). This is a short read, into which Sophie Hannah has somehow managed to pack numerous twists without ever making this slim little volume feel rushed or over-complicated: the careful layering of tension and atmosphere is executed at the perfect pace as The Orphan Choir edges creepily towards its climax. Suitably for a novel with Hammer connections, there's a strong gothic flavour, but it's employed in a modern setting, to excellent effect. The Orphan Choir is a beautifully constructed, atmospheric chiller which I highly recommend - and if you've got time to read it one sitting, so much the better, as once you get to the halfway point, you won't want to put it down.